It’s cold season, which means the germ-sharing festivities are well underway. If your household is like most, there’s a domino effect of colds passing between children and parents. You know the sniffling, sneezing, and runny nose are typical symptoms. But, there may be another common cold side effect plaguing you: tooth pain. Your sinuses are air chambers that rest behind your cheeks, eyebrows, and jawbones. They have tiny hairs called “cilia” inside them. Cilia helps clean out mucus and keep the area free from debris. When you have a cold, the chambers can fill up with excess mucus. Since one of the air chambers is up behind the upper jaw, it can cause what feels like a serious toothache. But, in fact, it’s just sinus pain caused by your cold. Apply Heat – Warm compresses, steam, and humidity can help get mucus moving out of your sinuses. Consider taking a hot shower or breathing over a bowl of boiling water. 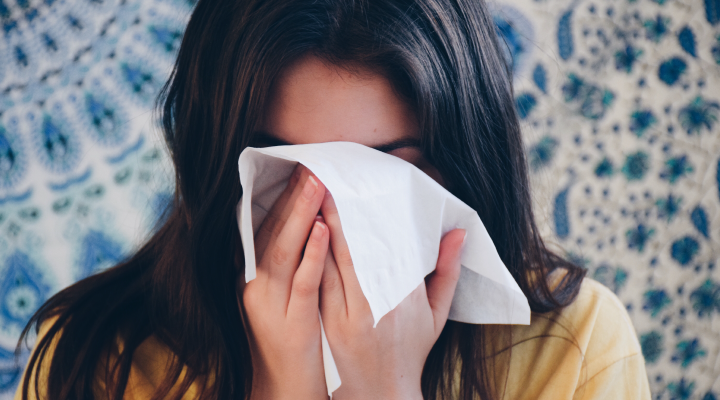 Rinse Sinus Cavity– Using saline to wash out your sinuses not only helps sweep away mucus, it also provides moisture directly to the inflamed area. Get plenty of rest — Give your body the chance to heal itself. If your tooth pain continues after your cold is gone, you may have an oral health problem and should make an appointment with your dentist.